Trish sipped her coffee and set down the paper cup. Missing her own coffee mug was one thing she hated about off-sites. "I didn't quite get some of those fallacies," she said to Nan. "They're a little confusing." Nan nodded. "Yeah, me too. But what did he say about that — something about the confusion is what makes them so common?" 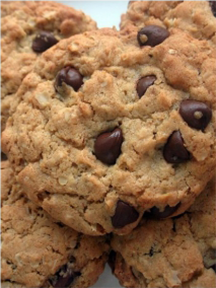 In 1997, the Commonwealth of Massachusetts adopted a bill proposed by the third grade class of a school in Somerset, and thereby designated the chocolate chip cookie as the official state cookie of Massachusetts. Photo courtesy Wikimedia Commons (cc) Lara Schneider. Just then, Peter came through the doorway, carrying a paper cupful of coffee and three huge chocolate chip cookies wrapped in a napkin. He sat down in the empty chair next to Nan. Nan smiled at Peter and, gazing at the cookies, she said, "Peter, how nice of you to think of us." Peter smiled back, took a cookie, and pushed the others to Nan. Then he turned to Trish. "So what's your favorite project fallacy?" Trish reached for a cookie. "I don't know," she said. "We were just saying that they're a bit confusing." "Yeah," said Nan. "I think he was saying that their wrongness is so subtle that we just accept them as conventional wisdom." And so it is with most fallacies. Their subtlety makes them durable. Here's Part II of a little catalog of the fallacies of project management. For Part I, see "Nine Project Management Fallacies: I," Point Lookout for November 30, 2005, and for Part III, see "Nine Project Management Fallacies: III," Point Lookout for December 28, 2005. A cousin of the Fundamental Attribution Error, this fallacy holds that professional credentials — experience, education, seniority, or past performance — are equivalent to abilities. For instance, if a particular project manager led a few projects that failed, we conclude that he or she is incapable. Judgments based on credentials and past performance alone are likely to omit from consideration the past prevailing context, which might have been a significant contributor to past results. To assess the capabilities of a person, an organization, a technology, or a design, consider not only credentials and past performance, but also contextual factors. so durablethis fallacy when we believe that the project manager, or some other organizational leader, creates a high performance team, without the assistance or influence of the people who belong to that team. To measure the prevalence of this fallacy, track the attributed causes of team performance. In organizations where the credit for high performance tends to flow to leaders, while the blame for dysfunction tends to flow to team members, it's likely that the Culturalistic Fallacy is at work. While any one person can undermine a team's performance, no single person is responsible for creating high performance. External factors certainly contribute, but a team's performance is most directly due to the choices of the members of that team. Would you like to see your comments posted here? rbrenUBzQfAEZGPekKzqDner@ChacyDmGpPmOrOtrunmEoCanyon.comSend me your comments by email, or by Web form. When projects founder, we're often shocked — we thought everything was moving along smoothly. Sometimes, with the benefit of hindsight, we can see that we had — or could have had — enough information to determine that trouble was ahead. Somehow it was obscured by fog. How can we get better at seeing through the fog? The scope of an effort underway tends to expand over time. Why do scopes not contract just as often? One cause might be cognitive biases that make us more receptive to expansion than contraction. I offer email and telephone coaching at both corporate and individual rates. Contact Rick for details at rbrenGNOopjaUIClHGWEzner@ChachYFiNmOmNbKNcSPXoCanyon.com or (650) 787-6475, or toll-free in the continental US at (866) 378-5470.